Simple demo of dense SIFT feature descriptors extraction. Compute SIFT keypoint descriptors on a regular grid over the input image. 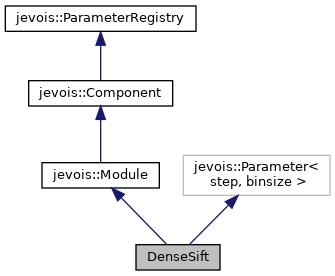 This module is useful when using JeVois as a pre-processor, delivering a dense array of keypoint descriptors to a host computer, where the array is disguised as a grayscale video frame. Upon receiving the array of descriptors, the host computer can further process them. For example, the host computer may compute camera motion in space by matching descriptors across successive frames, or may attempt to detect and identify objects based on the descriptors. Beware that changing the values for the step and binsize parameters changes the output image size, so you need to adjust your video mappings accordingly. Hence, setting those parameters is best done once and for all in the module's optional params.cfg or script.cfg file. This module can either have a color YUYV output, which shows the original camera image, keypoint locations, and descriptor values; or a greyscale output, which is just the descriptor values. This algorithm is implemented using the VLfeat library. It is quite slow, maybe because this library is a bit old and appears to be single-threaded. Definition at line 76 of file DenseSift.C. Definition at line 84 of file DenseSift.C. Definition at line 87 of file DenseSift.C. References jevois::RawImage::buf, jevois::rawimage::convertToCvGray(), jevois::rawimage::drawDisk(), jevois::rawimage::drawFilledRect(), jevois::RawImage::fmt, jevois::RawImage::height, JEVOIS_REGISTER_MODULE(), LFATAL, jevois::rawimage::paste(), jevois::rawimage::pasteGreyToYUYV(), jevois::RawImage::require(), jevois::Timer::start(), jevois::Timer::stop(), jevois::warnAndIgnoreException(), jevois::RawImage::width, and jevois::rawimage::writeText().